Formula DRIFT kicks-off the 11th championship season on the Toyota Grand Prix of Long Beach Street Course. The Toyota Grand Prix of Long Beach Street Course has been around since 1975. Highlighted by Formula 1, IndyCar, American Le Mans Series, The Toyota Pro/Celebrity race, and now Formula DRIFT. 2014 will be Formula DRIFT’s 9th consecutive year at the famous Street Course. The expanded 2-day event will again be one week prior to the Toyota Grand Prix of Long Beach. 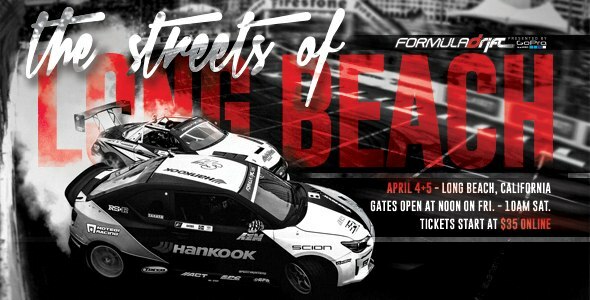 Round 1: Streets of Long Beach will kick-off the 2014 Championship season in style with new cars, new drivers, and all the sideways excitement that Formula DRIFT is known for. Champion Michael Essa will be back to defend his title against all competitors including Chris Forsberg, Daigo Saito, Fredric Aasbo, Vaughn Gittin Jr., Justin Pawlak and the rest of the talented pool of drivers. Don’t miss out on the exciting 2014 Formula DRIFT Season Opener on April 4 – 5! 6:00am – STREET CLOSURES BEGIN: Effecting Shoreline Dr., E. Seaside Way, Linden Ave., Hart Pl.